There's just something about a good, thick face mask that I love. It makes me feel like I'm really treating my skin to something special. For these hot summer months, you may see some extra oil, blemishes or sun damage showing up on your skin. Add some mud or clay to your beauty routine and you're sure to get back to your naturally flawless face. With the power of Bentonite Clay and Salicylic Acid, Pur Minerals Dirty Girl Detoxifying Mudd Masque unclogs your pores and eliminates excess oil. Use as a spot treatment on blemishes to provide extra healing power. After rinsing, follow with Pur Minerals Miracle Mist (one of my faves!) for even better results. Repair and soothe skin with Osmosis Skincare Repair Healing Mud. Not only will it help calm post-procedure skin or a sunburn, but it also encourages collagen, promoting overall healthy skin. 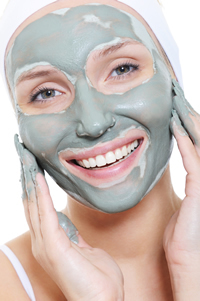 You can even customize your results by using this "mud" as either a serum, mask or overnight treatment. If the results of this masque are as good as its ingredients, you're in for a treat! Glytone Essentials Deep Cleansing Masque is full of beneficial ingredients like Bentonite, Kaolin, Glycolic Acid, Zinc Oxide, Vitamin C and Lactic Acid. So, what can you expect? Clear and minimized pores, softer, smoother skin, reduced oil, improved tone and texture for an all over brighter glow. Utilizing clarifying ingredients like Salicylic Acid and Kaolin, combined with the soothing and hydrating properties of Aloe, Vitamin E and Hyaluronic Acid, Jan Marini Retinol Plus Mask is your go-to for reducing fine lines, wrinkles, hyperpigmentation, sun damage AND acne! Oh, did we mention it also has a high concentration of all-trans-retinol? You better believe this mask will powerfully resurface your skin and minimize your pores. You also don't have to worry about irritation because its unique formula will soothe and calm your skin. Not sure how to apply your mask? Check out Beauty 101 for an easy to follow video on How to Apply a Face Mask.